I love summer in Iowa because we have Farmer’s Markets that are full of fresh fruit, vegetables, baked goods, local meats and eggs, beautiful flowers and various homemade sewn goods. On Saturday morning I headed with the girls to our Farmer’s Market. Each week there are more and more vegetables and fruits to choose from.Â My favorite Farmer’s Market finds are tomatoes and sweet corn.Â BLTs and sweet corn were a staple of my childhood meals. 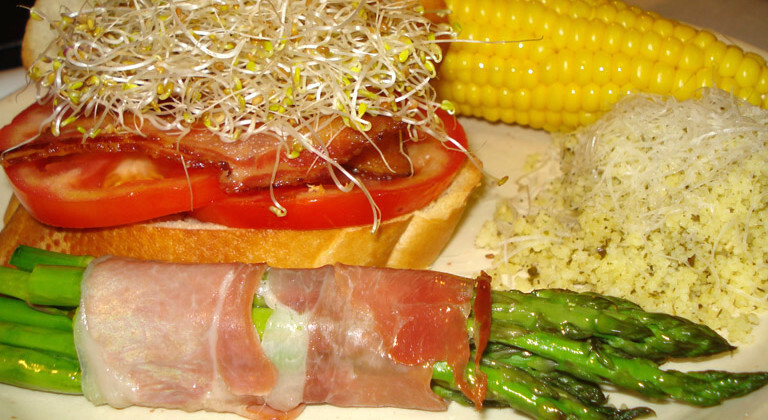 Our dinner was a delicious BLT (I switched the lettuce for some local sprouts), sweet corn, asparagus wrapped in prosciutto, and pesto couscous.This is a perfect summer meal! ENJOY! Blanch asparagus. Wrap prosciutto around 6-7 pieces of asparagus. Lightly spray bundles with canola oil. Roast in oven for 5-10 minutes. Preheat oven 425 degrees F. Lay slices of bacon on cookie sheet, cook for about 15 minutes. Once done lay on paper towels to absorb grease.